"Next Time I Fall" were the best singles, but the title track was not bad. Often when singers leave bands to go solo, they never experience anywhere near the same success. That wasn’t the case for Peter Cetera. After he left Chicago, he went on to considerable success as a solo artist, almost eclipsing the band itself. In the summer of 1985, CBC’s “Good Rockin’ Tonite” had Foster and Cetera appear as their guests. It was the first time I had ever known that was the name of the singer. Host Terry David Mulligan asked a variety of questions. The one I recall best, was when he asked Cetera if he heard any emerging summer hits. Cetera said it was pretty early, but if he had to hazard a guess, it was “Some Like it Hot”, a song by The Power Station. The interview had been taped. When it faded out to Mulligan alone on set, he said shortly after that interview was taped, Peter Cetera announced he was leaving Chicago. What would become of Peter Cetera? It did not take long to find out. The voice sounded familiar, but it was hard to tell for sure in the setting I was in. My buddy and neighbour Mat was working on a nearby egg farm. They were cleaning out a barn, and needed a bunch of people to do the work. So Mat rounded up a bunch of us – me, my best fried Chris Vining, a guy named Mike, and some others. Mat flipped on a ghetto blaster he had to help pass the time. Suddenly, it came on. It sounded like Chicago, but I wasn’t sure. I’d been concentrating pretty intently, so I only clued in part way through. Of course, as always seemed to be the case back then, when the song finished the deejay didn’t bother saying who sang it. I waited for the song to come back on, and I think it did, but I couldn’t make out much. That night, I flipped on the same station we had been listening to at the egg farm. It was AM 1060, but curiously it marketed itself as AM 106, maybe to make it sound more like an FM station. They had two shows Mat listened to that he told me about: “The Top Six at Six” and “The Top Ten at Ten”. They were the most requested songs of the day. I got home after six, so at 10 p.m. I tuned in. Adding to the mystery was that after around 10 p.m., the signal began to weaken, and there was a lot more static. Conceivably, I might not hear the song if there was some ill-timed interference or static. And that almost happened – but it didn’t. Instead, I discovered the song was called “The Glory of Love”, and sure enough it was by Peter Cetera. What really peaked my interest was the song was off the soundtrack for the soon-to-be-released sequel to “The Karate Kid”. “The Glory of Love” bolted up the charts all the way to number one on the Billboard Hot 100, where it stayed for two weeks in August of 1986, before being displaced by Madonna and “Papa Don’t Preach”. The song would go on to earn an Oscar nomination for best original song, losing to “Take My Breath Away” from “Top Gun” and performed by Berlin. Cetera would also be nominated for best pop vocal performance by a male artist, losing out to Steve Winwood and “Higher Love”. 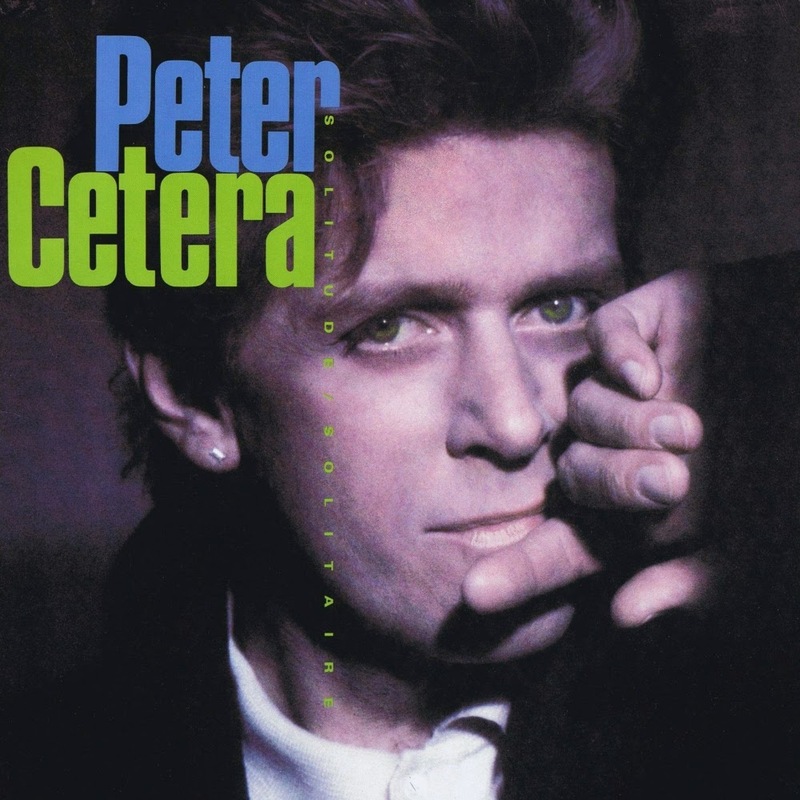 “The Glory of Love” was released as part of Cetera’s solo album, “Solitude/Solitaire”. A few months later, Cetera was back on top of the charts with another number one single. This time it was a duet with Christian singer Amy Grant called “Next Time I Fall”. I always recall the video, set in a dance studio, shifting back and forth between the dancer, Grant, and Cetera. “Next time I Fall” displaced “You Give Love A Bad Name,” Bon Jovi’s first number one single, in early December of 1986, then after a week on top was displaced by “The Way It Is”, Bruce Hornsby and the Range’s first number one single. Cetera and Grant would be nominated for a Grammy for best pop performance by a duo or group with vocals, losing to "Dionne and Friends" for “That’s What Friends Are For”. Perhaps the best accolade Cetera received was not an award, but the satisfaction that his first post-Chicago solo album sold more copies than Chicago’s next album – “Chicago 18”. To be honest, Peter Cetera always was Chicago for me. Some of their other songs grew on me over time, and I really like them, but I enjoyed his lead vocals the most. The audience seems to agree. Although Chicago may have sold as many or more records than any other group in the 1970s, their only number one single on the Billboard Hot 100 was “If You Leave Me Now” – sung by Peter Cetera. Once David Foster came aboard, and began to emphasize all those great ballads, it was a lock – Peter Cetera was Chicago. So when he went solo in 1986, it was pretty much a certainty it would be good – and it was. I may have grown a little tired of “Glory of Love”, but that was due to vinyl fatigue – it always seemed to be on the radio, but “Next Time I Fall” has remained one of my all-time favourite songs. It is a testament to the power of Peter Cetera’s voice as a balladeer.